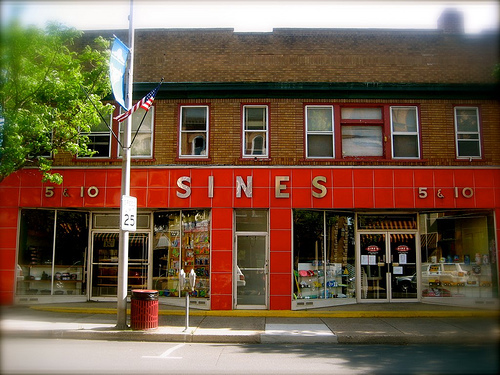 We've been invited to attend a roadtrip blogger bash at Sine's 5 & 10, a 100-year-old dime store in Quakertown, Pennsylvania with a real lunch counter and you're invited too. It's from 1-3 pm this Saturday (Sept. 15) and the hostess with the mostess throwing the shindig is the fabulous Mod Betty of the equally fabulous Retro Roadmap website. 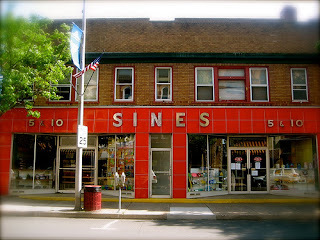 WendyVee, a frequent groovy commenter here and proprietor of our kindred spirit Roadside Wonders site will be there too. Click here for more thorough details, and hope to see you there. I'm a bit too far away but sounds like fun! Hey Beth, Please bring one of your Retro stickers so I can christen my car! Gregory, We'll have a grilled cheese in your honor. Will definitely bring a sticker! Looking forward to it!